SQL code can have different SQL formatting styles, which could make a job either easier or more difficult. It can make code difficult to unscramble and understand. A clean SQL can be read faster than an inconsistently written SQL; SQL reviewing and troubleshooting are more efficient; joint development efforts are more effective; handing off projects from one team to another is easier. How to make code readable so that it is enough just to skim through the code and get the general idea. It’s the SQL formatter that makes the difference. All SQL code can be formatted manually, which is very time consuming but 3rd party SQL formatter tools do exist and can be used to help formatting quickly and efficiently. This article will guide you through some SQL formatter options via SSMS and using 3rd party SQL formatting tool such is ApexSQL Refactor to format code. So, let’s first start with SQL formatter options to format code and then ApexSQL Refactor add-in to do the same thing and more. In SQL Server, three are three options for indenting of SQL code. By default, this option is used. It determines the appropriate indenting style to use. In the Tabs tab, it can be specified how many spaces compose a single indentation or tab, and whether the Editor uses tabs or space characters when indenting. When T-SQL scripts were created with lengthy T-SQL lines, to review code in such T-SQL scripts either use the horizontal scroll bar or create line breaks at various points to make the line readable and rid of the horizontal scrollbar. Scrolling or having to break the lines of code reviewing of code can be time consuming. In SQL Server Management Studio (SSMS) there is an option for word wrapping. The Show visual glyphs for word wrap option placed marks on every line where the word wrapping is applied. In the example below a SQL code is shown without Word wrap and Show visual glyphs for word wrap options and with these options checked. As it can be seen, the horizontal scrollbar is gone and places, where the word wrap have been applied, are marked. This part of article will explain in base what can be archived with ApexSQL Refactor free SQL formatter tool. Co-workers can import shared SQL formatting profile and multiple apply it on theirs SQL objects (stored procedures, functions, views) or SQL scripts by using Format SQL objects feature for SQL objects or Format SQL scripts feature for SQL scripts at once. 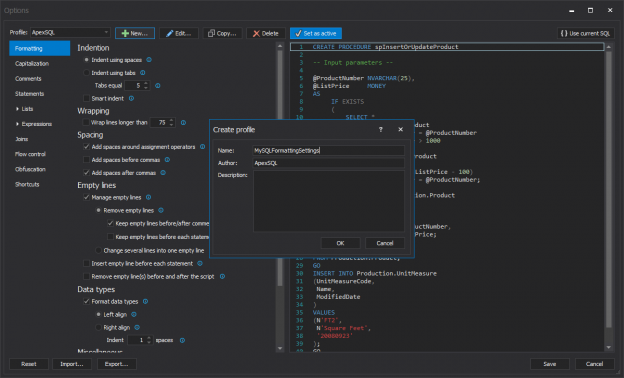 More about ApexSQL Refactor SQL formatter features and options can be found on the Top things you need in a SQL formatter tool page.